Nine years ago today, the world was reeling from the news of the September 11 attacks in America. Every year since, the anniversary of the attacks has been marked by poignant ceremonies. But the commemorations 11 this year were distracted by two peripheral controversies. The first was a proposal to build an Islamic cultural centre several blocks away from Ground Zero in New York. Critics, of whom there are many, said that the centre would offend many people, as the terrorists who committed the atrocities were Muslim. The counter-claim is that associating the cultural centre with the attacks implies that Islam itself is linked to terrorism, and is therefore wrong. The plans for the cultural centre sparked even greater controversy when an obscure American pastor, Terry Jones, threatened to burn the Koran on the anniversary in protest. Although he cancelled the burning in the end, his threats sparked widespread national and international condemnation, and anti-American and anti-Christian protests erupted across the Muslim world. It is unfortunate that the commemoration of the attacks was distracted by the controversies, but it is obvious that they are more than just about the direct legacy of the attacks—they point to some unsolved questions about the relationship between America and the Islamic world, and the deep-seated mistrust of each other by citizens on both sides. Disregarding the large number of complex political and historical factors for this distrust, one of the most basic reasons is the ongoing war in Afghanistan. Americans fume that Osama bin-Laden, the mastermind of the attacks, has not been caught and brought to justice. 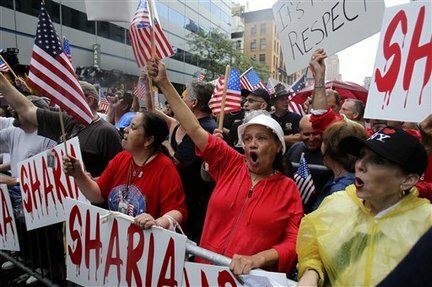 Meanwhile Muslims are infuriated that Americans have in effect occupied Afghanistan. 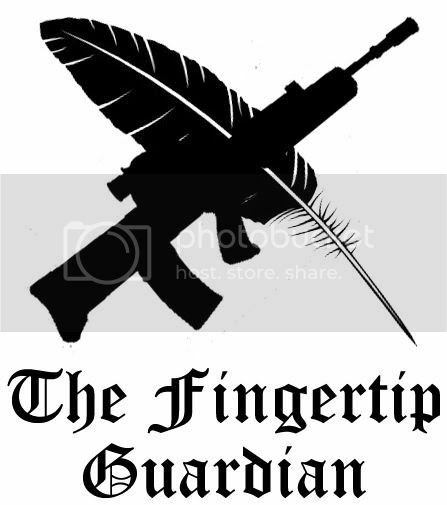 The current counter-insurgency operations there do not bring capturing bin-Laden any closer, and neither does it assuage Muslims who are angry that the war is causing so much destruction in Afghanistan. Add to the mix the disastrous failure of western intervention in Iraq, and one is left with little wonder why the wounds of September 11 have festered, feeding on and breeding mutual mistrust that bubbled over this weekend with the question of the location of the centre and the threats to burn the Koran. The fact that the controversies are symptoms of wider problems are made clearer by comparing them with another that should have caused similar outrage, but did not. Some who protest the location of the Islamic centre may, to prove their point, ask: “what would national feeling be if a Japanese Shinto shrine was built near Pearl Harbor?” In fact, there is a *Shinto shrine in Honolulu a few kilometres southwest of Pearl Harbor, which was first established in 1920, shut down in 1941, and reopened in 1948. But there are no protests there. It is not that the memories of the 3,000 or so American servicemen killed at Pearl Harbor are less important than those of the people killed on September 11; it is simply because Japan and America no longer view each other as enemies. Even though the beliefs of Christianity and Shintoism differ fundamentally, no Christian minister has ever tried to protest against the Japanese attack by threatening to burn the holy books of Shintoism. The current controversies regarding the cultural centre and the pastor’s threat therefore point to a deep undercurrent in American society—it is still in the mood of setting heads rolling for the attacks. The failure of the American government to capture bin-Laden has made it easier for the vindictive mood to be shifted towards Islam in general. That in turn continues to drive a wedge in relations between the west and the Islamic world, ensuring that peace lies further beyond reach. * The author is not responsible for the content of external sites! "Mah vote is worth mair than yoors, sassenach." Last night, the House of Commons voted by 328 to 269 to continue the process to pass the Parliamentary Voting System and Constituencies Bill. It will now enter its Committee stage to be scrutinised in detail. As said yesterday, the Bill hopes to achieve two aims: pave the way for a referendum to change the way we elect MPs and reduce the number of MPs to 600 while equalising the number of people MPs represent. Today we will explore the second aim, which is as controversial the first aim. Both sides of the debate have accused each other of trying to manipulate the electoral system to their advantage. There are currently 650 Members of Parliament, the highest number ever. The Commons Chamber has long run out of space to seat everybody—there are only 427 seats available. But it is more than just overcrowding at the Grade 1 listed Palace of Westminster that is a concern. The House of Commons is currently larger than the US House of Representatives and Senate combined, the French Assemblée Naitonale and the German Bundestag. Is having so many MPs efficient, especially in the age of austerity? But the real controversy lies with the implications of reducing the number of MPs, and not the reduction itself. Cutting the number of MPs means that constituency boundaries across the country will have to be redrawn, which would uproot the power base of certain parties depending on how the boundaries are redrawn. The Bill proposes to redraw them so as to equalise the number of people each MP represents. According to the four Boundary Commissions, which are in charge of drawing the constituency boundaries, the Isle of Wight constituency in south England has more than 100,000 eligible voters, whereas Na h-Eileanan an Iar (the Outer Hebrides in west Scotland) has only about 20,000. In theory, this means that a vote cast in the Outer Hebrides is five times more powerful than a vote cast in the Isle of Wight. On the other hand, the MP for the Outer Hebrides would theoretically have less work than the MP for the Isle of Wight, and can therefore spend more time doing constituency work. That seems unfair, and isn’t it obvious that change is needed? Well, not really. The Labour party is against this proposal, arguing that a further look into the numbers, for example taking into account voter turnout, shows that there is no bias in the way constituency boundaries are drawn, and any change in the system is but a Tory manipulation of the system. The Tories and Lib Dems retort that Labour’s objections stem from the fact that it will lose its current favourable electoral bias. They sneer that Labour is more concerned about its own electoral advantage rather than the fairness of the system. Minority parties in the nation are also disapproving, as redrawing the boundaries and redistributing electorate sizes would reduce the number of MPs that their nations return to Parliament, even though currently, a vote from the nations generally have more “power” than a vote from England and the nations have, in addition to Parliament, their devolved assemblies. It turns out that the Bill is a great revealer each party’s motives in ensuring that the system works “their” way. The Liberal Democrats will probably be the biggest winner if AV is adopted, as it is often the second preference for both Labour and Conservative voters. The Conservatives will gain if constituency boundaries are redrawn and electorate sizes equalised. Labour and the national parties protest because they think their power could be reduced in future elections. So which system is fairer? Does anyone care? That word is only bandied about when there are benefits and advantages at stake. There are undoubtedly rights and wrongs in politics; it just so happens that they have to be aligned with benefits and disadvantages to be talked about. Want to revolutionise the way we vote? "What do you mean I'm counting it the wrong way?" Parliament began the new term by debating the Parliamentary Voting System and Constituencies Bill. If passed, the system of deciding who governs Britain could change forever. But how? Today’s and tomorrow’s posts attempt to explain. On the first day Parliament returned from summer recess, it began debating the Parliamentary Voting System and Constituencies Bill. The Bill was a key demand for Liberal Democrats to join the Conservatives in coalition, and will be an important test of the strength of their partnership. If passed, the Bill would do two things. First, it would enable a referendum to be held on the future voting system for electing Members of Parliament. Secondly, it would reduce the number of constituencies from a record high of 650 to 600, and even out the number of people each MP is meant to represent. Let’s first look at the proposals for a referendum on the alternative vote. The referendum, to be held next May alongside elections in all the four nations, will ask the electorate whether they want to replace the current “first-past-the-post” system of electing MPs with the “alternative vote” system. First-past-the-post is very straightforward. It basically means “majority wins”: whoever receives the most votes wins the seat. However, many criticise it for its unfairness. if 51% of the electorate votes for Party A, and 49% Party B, Party A’s candidate can hardly claim to have won over the electorate. Choice is also limited, as many voters might have to opt for who they think will win, rather than who they hope will win, as process known as tactical voting (e.g. a Liberal Democrat-supporter votes Labour instead of Lib Dem because she wants to “keep the Tories out”, rather than truly wanting Labour to win). The ultimate result of FPTP could be that the party that commands a majority in the House of Commons, which becoming the governing party, may be enjoying only very weak popular support. For example, after the 2005 election, Labour only took 35% of the popular vote, yet ended up with a 157-seat majority over the Conservatives, who won 32% of the vote. A system of alternative vote would change how people cast their votes. Instead of picking one candidate, people will list candidates by preference: 1, 2 and 3. If a candidate gets more than 50% of first-preference votes (i.e. “1”s), he wins. But if that is not achieved, the candidate who holds the fewest “1” votes will be eliminated, and the second-preference votes (the “2”s) of those ballots will be distributed among the remaining candidates. Eventually, a candidate will obtain more than 50% of the vote and win. This system is praised by some to be fairer, as the winner would have to have gained at least half of the electorate’s approval. But the price of “fairness” could be to complicate the composition of Parliament. Majority governments will be harder to emerge, and more hung Parliaments will produce more coalitions. But the British people have now seen how a hung Parliament can work, and may decide that having them once in a while to keep party politics in check is beneficial. Of course, another drawback is to increase the workload of vote-counters on election night. Of course, the AV system itself is not alien to Britain, as it and its variants are used to elect the party leaders of the Labour and Liberal Democrat parties and the mayors of London and other cities. The Conservative party is against the proposal, but was forced to accept the referendum as part of the coalition deal with the Liberal Democrats. It is expected that Conservative MPs will vote the Bill through to allow the referendum to happen, but campaign against changing the system next May. Tomorrow we will look at the other half of the Bill, which proposes to reduce the number of MPs and to “equalise” the size of constituencies. Do you support the first-past-the-post, alternative vote, or another voting system? Let me know! "Let's try - again - to be friends." The dead horse of the Israeli-Palestinian conflict is being flogged again. I will give it one more lash, and then I’ll never bother to write about it again because the same, old things keep coming up. The first direct talks between the leaders of Israel and (at least half of) the Palestinian people in nearly two years have started today in Washington DC under the auspices of President Obama. Since the last ones broke down in December 2008, just before an Israeli-Hamas war in Gaza, both Israel and America have changed leaders (although Israel’s prime minister, Benjamin Netanyahu, has been PM before). The Palestinian leader Mahmoud Abbas is the sole survivor. There are new faces, but already many predict the same, old outcome, in that the leaders will meet, talk, disagree and part their own ways, each claiming to have offered as much as they could and blaming the other side’s unwillingness to compromise. The main issue is that old problems remained unsolved. The one mutually agreed-to principle to a lasting peace – that the disputed land will eventually be split between Israel and Palestine – was formally accepted by both sides only in 2007, even though the idea has been around for decades and was probably the most obvious solution. At that kind of pace, when will all the other issues be settled? And the issues are many, with profound disagreements on each of them. Where should the borders be? What to do with Jerusalem? What about the Jewish settlements in the West Bank? Should Palestinian refugees be allowed to return to their pre-1948 homes? When can Palestinian prisoners in Israeli jails be released? The list is long. 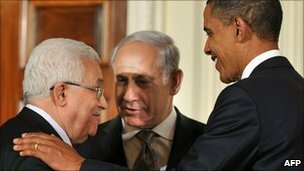 Only recently US-Israeli relations were shaken over the Israeli refusal to freeze settlement-building in the West Bank, much to the chagrin of Obama and Abbas. Netanyahu’s Likud party is currently in coalition with Israel’s right-wing nationalists. If you think getting some Tories to like the idea of Europe as being difficult, think how challenging it must be for Netanyahu to get his coalition partners to agree to any concession. To compound issues even further, the biggest thorn in the peace negotiations, namely the presence of Hamas as a force to be reckoned with in Gaza, is unlikely to go away. No matter how desperately the west, Israel and Fatah (Abbas’ party) want to ignore the group, which ousted Fatah from Gaza after the Palestinian general elections in 2006, it is here to stay. No official engagement with Hamas has to date been made by the other parties, but as long as Hamas is not somehow involved, no comprehensive peace will ensue. But getting Hamas officially involved without the group acceding to Israel’s demands for recognition would simply be impossible. On the other hand, getting Hamas to recognise what Israel demands without some sort of major conciliatory gesture by Israel is also out of the question. Thus, so far, the talks seem to be heading to another dead end. Still, the talks have only just begun, and there is everything to play for. If Netanyahu and Abbas can somehow manage to defy all odds and come up with anything resembling a longer-term peace plan, the cost of Hamas holding out will be increased. Gazans may not settle for second-rate status if their neighbours in the West Bank are due to be better off because of a peace deal with Israel. But that is a big “if”, and “all” odds is still quite a lot. If something impressive does turn up, I may be enticed to write another article on the subject. Scandals involving politicians are breaking out left, right and centre – again. But what do they say about you and me? Even with Parliament in summer recess, a number of scandals and would-be scandals involving our nation’s politicians found their way into the tabloids and blogs. In June (before the recess), the Liberal Democrat Climate and Energy Secretary of State Chris Huhne announced he was divorcing his wife over a woman who worked as his campaigner. Then, Conservative prisons minister Crispin Blunt, a married father of two, came out of the closet and declared that he was also seeking a divorce. Most recently, an aide to William Hague, the Foreign Secretary, has had to resign over unsubstantiated claims of a relationship between him and his boss. Of course, those are by no means the only scandals (or would-be scandals) involving politicians to break out historically, or indeed recently. I have long been desensitised by them. Some of us may still shake our heads at them, disappointed at the seemingly low moral standards of our politicians. We expect them to be clean and honest, driven to public life by duty and compassion rather than power or prestige. In short, we expect them to be like us. I’m sure many of us would like to think of ourselves as reasonably good people. After all, perhaps apart from the occasional speeding in “safe” conditions or convenient littering, we do not break the law. We work hard to provide for our families, saving up and investing for a comfortable retirement, and even try our best to live ethically and give to charity. Then we take one look at the state of our politicians, and snort at, or are perhaps saddened by, the details over their private lives. If you are doing any of those things, I beseech you to stop. Politicians aren’t inherently worse than you and I, even as they crave power and popularity. Their lives seem so messed up only because they are being lived out in the public, whereas ours are protected solely by anonymity, not by our inherently better nature. For example, all hell quite rightly broke loose when the parliamentary expenses scandals surfaced. MPs should not have been claiming for things that were not related to work, even if it was within the rules at the time. Yet outside the public glare, this sort of behaviour happens everywhere, committed by “hard-working”, “honest” people, like us. What about that expensive gourmet lunch you had on company’s expense when you could have made do with a sandwich? Or that taxi ride the company paid for when you could have taken the bus? If our own lives were lived in the limelight, what sort of commentary would the tabloids run on us? 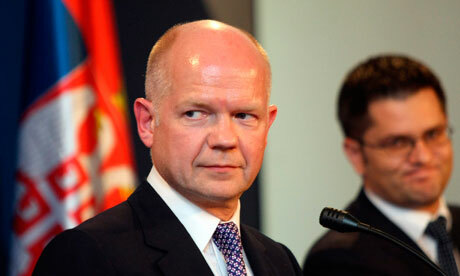 The latest intense speculation over William Hague’s apparent relationship with his special adviser proves my point. We are so perversely interested in someone else’s private lives, and yet still claim the moral high ground and expect our own privacies to be preserved? Sure, in exchange for power and popularity, politicians gave up their privacy. But they didn’t give up their imperfections, and it would be highly unreasonable for us to ask them to, unless we asked ourselves to get rid of all our little imperfections. Politicians are, after all, only human. They too work hard (I’ve seen them) to provide for their families, and I believe that they entered politics at least partly because they wanted to build a better society. So stop wondering why politicians aren’t better people: they aren’t because we aren’t.